From “Joyful Momma’s Kitchen- Cooking, Baking, and Mess Making” (http://joyful-mommas-kitchen.blogspot.com). 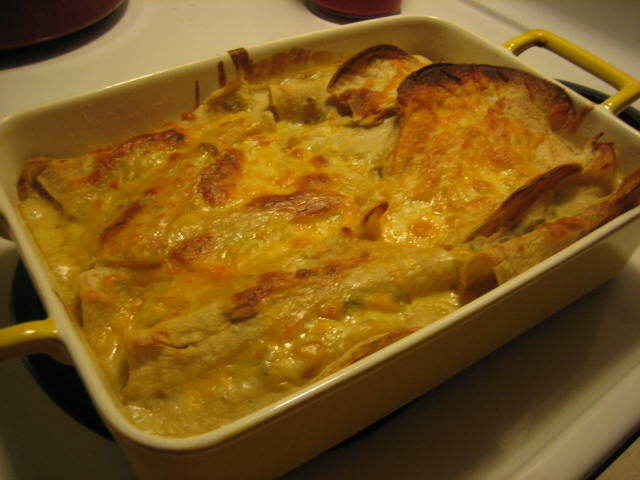 I had been searching for a white-sauce chicken enchilada recipe for a while, and this one is quite tasty! Mix chicken and 1 cup cheese. Roll up in tortillas and place in pan. In a sauce pan, melt butter, stir in flour and cook 1 minute. Add broth and whisk until smooth. Heat over medium heat until thick and bubbly. Stir in sour cream and chilies. Do not bring to boil, you don’t want curdled sour cream.